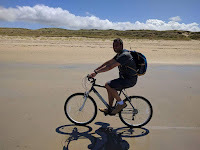 Having decided there's no need to travel half way across a country between camping stays, to mix things up a bit, this summer's fortnight holiday will be spent along France's West coast, starting at Ile d'Oleron and then heading a couple of hours south for each of our other two bases. We were worried about a reported two hour delay near to the Folkestone Channel Tunnel terminal and so, before the Dartford Crossing, we put back our scheduled train by 90 minutes. The traffic was just clearing as we got nearer and as it turns out we'd have been ten minutes early for our original booking.